The holiday season is a wonderful time to plan Christmas acts of kindness! Why? First, people seem especially receptive to receiving acts of kindness this time of year. I mean, come on–wouldn’t you love for someone to give you a random act of kindness during the hectic Christmas season? Second (and most importantly), Christmas acts of kindness are such an incredible way for us to live out the Christian principles of humility, giving, service and love. What a better time to do this than during the season when we celebrate God’s greatest gift to mankind–the birth of Jesus? 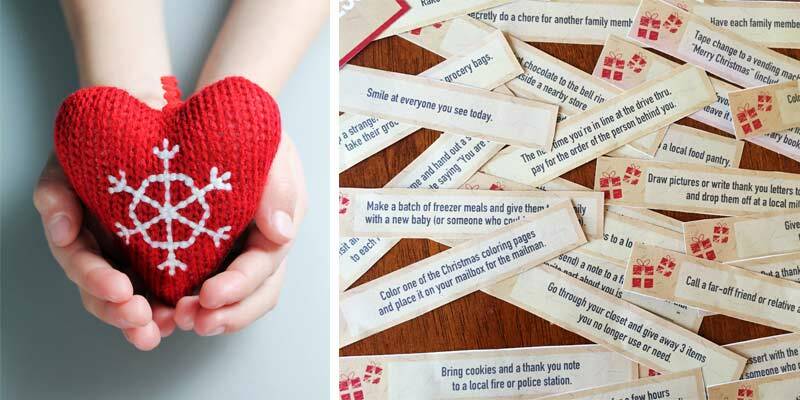 OK, so we get it–Christmas acts of kindness rock. But let’s get real: How do you actually plan and orchestrate something like that? Especially there are several acts of kindness you want to do and if you’d like to make it a family activity for everyone to participate in? Great question! I have two suggestions: Make a plan; and make it fun. Now you could spend a ton of time online and try to accumulate a whole bunch of different acts of kindness activities. But, come on. You’re a mom! And it’s Christmas! Do you really have time to be plowing through page after page compiling a list? That’s why I want to make it really easy for you. I’ve got an awesome list of 30 Christmas Acts of Kindness already figured out for you as part of the Christ-Centered Christmas Family Traditions Printables System! I’ve already done the heavy lifting here! All these ideas have been compiled and figured out! I’ve included resources so that you can make these 30 Christmas Acts of Kindness into a fun game that your kids will love! BOOM! You’ve got to love easy, simple (and fun) things, right? As I mentioned, the products shown here are from the Christ-Centered Christmas Family Traditions System–a fabulous collection of 143 printable resources that make it easy for you and your family to enjoy wonderful, Christ-centered Christmas celebrations like this! Plug and Play. Girl, with this system, the Christmas Acts of Kindness are already figured out for you! No guessing or compiling. Just print, cut and go! Great Fun for Kids. Kids can take turns grabbing each day’s slip and reading what’s planned. Or if you’d like to plan out each day’s act of kindness in advance, you can pin the slips in order on a banner. Fold over the top (so that it’s a secret for the kids!) and enjoy opening them up each day to reveal the activity. It’s a wonderful family tradition that makes the truths of the Christmas story become powerful and personable! Fully Customizable. There are 30 acts of kindness ideas, but of course you don’t have to do all of them! Just do the activities that would be a good fit for your family and that make sense for your schedule. Perhaps you choose to do acts of kindness on Sunday afternoons as part of your Advent tradition. Since the system also contains several blank slips, you can add in your own Christmas Acts of Kindness ideas should a fun idea strike your fancy. Engage and Go Deeper. Partner these Christmas Acts of Kindness with the 30 Day Christmas Countdown Bible Study that’s also a part of the Christ-Centered Christmas Family Traditions System! Together, these activities are a wonderful way to pair learning about God and then putting the truths in action! Along with the bible study, the system also contains several Bible response tools that encourage your family to really consider and apply what they’ve learned that day. Christ-centered, customizable home decor (that you and your family can make together! ), including banner pieces, and 8 x 10 and 5 x 5 full-color art! You can see them all in action here! The Christ-Centered Christmas Family Traditions System includes everything you need to finally discover the Christ-Centered Christmas you and your family long for! I know that you’ll love doing these Christmas Acts of Kindness with your family… along with the other parts in this incredible system! Make this the year that your family experiences and lives out the truths of the Christmas season through Acts of Kindness activities! And don’t forget to learn more about the 30 Day Christmas Countdown and the rest of the awesome resources in this system here!